Looking for flush (flat) panel garage door installers in the southwestern Ohio area? Need to repair your door? Want to replace your old door and trying to decide on a style? Whatever your case, Overhead Door Co. of Greater Cincinnati can help. 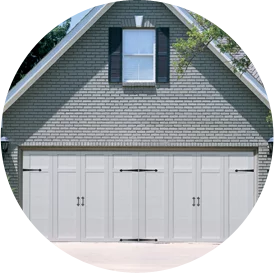 Do you need to install a new garage door? Flush panels are flat and slightly textured, and they can be used to complement a home’s architecture without drawing too much attention to the door itself. Flush panel garage doors are often windowless. They work well on modern and contemporary homes. Overhead Door’s Thermacore® collection features doors with flat panels. Need to repair your flush panel garage door? Don’t wait to call us! Whether your door won’t open all the way or a panel is dented, our team has you covered—and we offer 24-hour repair service. Want to install a new flat panel garage door for your home or commercial building in the Cincinnati, Ohio area? Get in touch with us today!